When involved or following the discussion about renewable energies we repeatedly experience a grave lack of understanding of the physical or engineering constraints that govern the design of our power system in general. This holds particularly for our electrical system where the lacking understanding of the engineering background leads to over-simplification and thus an ill-conditioned and skewed discussion. 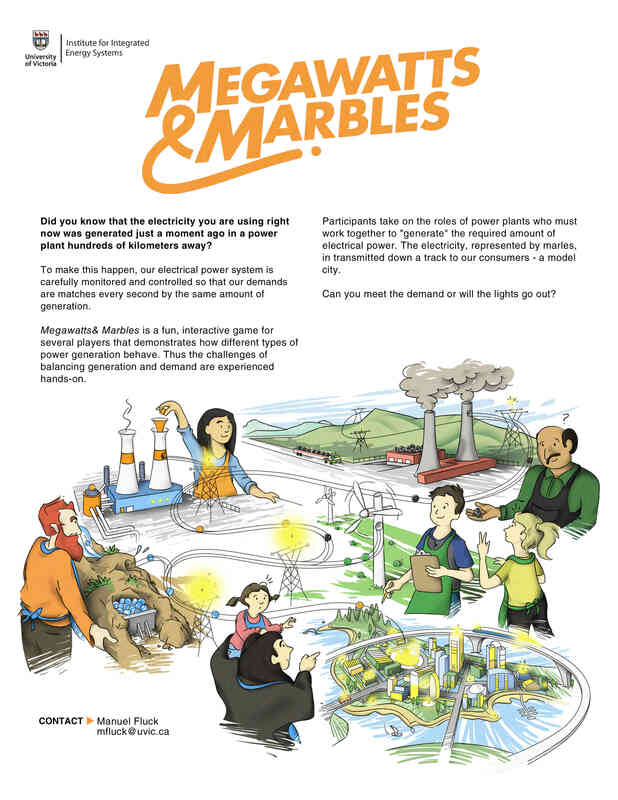 To improve this and offering the public better understanding for making sound decisions on future energy system developments we are developing a fun, interactive marble game to teach a wide audience the engineering challenges to run our electrical system. Participants experience hands-on how the system has to be carefully balanced and monitored, and which role renewable (intermittent) sources play. 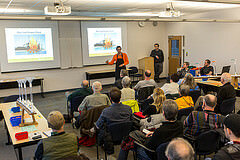 At this point we have run the game with both, youth and adults, at UVic's Ideafest and through​​​​​ ScienceVenture at UVic. With the support of IESVic we are working a a version that ScienceVenture will take out to schools all over BC starting next year. Running our Megawatts and Marbles game at IdeaFest 2015. Inspired by the great success and the very positive feedback we started selling kits of the game (six of them are being shipped to the Max-Planck-Institute in Germany in April) and are currently exploring other options to bring the game to a wider audience.